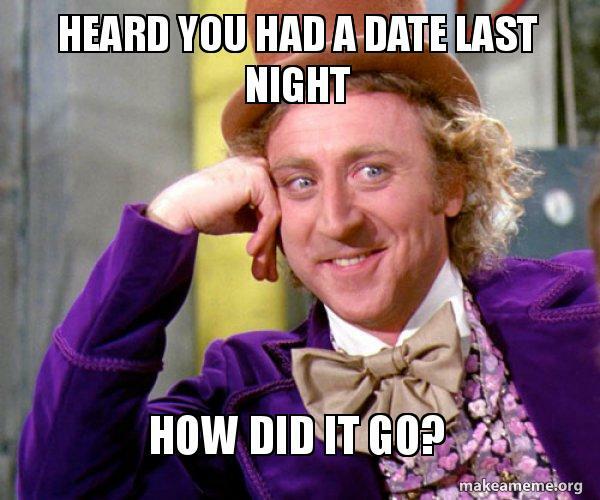 So You Went on a Date. Now What? So you went on a date, but how do you know if it went well? How do you know if you’ll do it again? How do you know if he's into you? All of these questions are swirling in your mind, but where are the answers? In order to find these answers, you have to be perceptive. You have to be aware of what he’s saying and what he’s potentially hinting at. It’s all in the little comments, like “Yeah, we should definitely go there next time” or “I like this place, we should go”. You + me = we. Once he starts saying “we,” you know that there will be another date, another time together, and another memory made. Complementary to this, he has to show that he wants to get to know you. He has to show interest in not just what you look like, but who you are. Listen to “Take Me There” by Rascal Flatts and you’ll know exactly what he should want to know. He should wanna know “Where your hopes and dreams and wishes live, where you keep the rest of your life hid.” If he asks you these questions regarding the person you are, then you know he’s interested in you. He wants to know everything about you, and pay close attention to the details about you. It’s not just what he’s saying though -- it’s about how he’s saying it. Is he happy when he’s with you? Is he smiling a lot? If the answer is yes, then he’s into you! If he’s having a good time, and you’re having a good time, that usually means he’ll want to spend more time with you. When I’m on a date, I see it in their eyes and hear it in their laugh. There’s a look of happiness that is vocalized in the way they laugh that makes you know that this is a good night. Another indicator is how he’s spending time with you. Does he want to just end it or does he want to continue talking to you and being around you? If he’s continuously thinking of new ways to spend the night, then you have a guy who wants to spend as much time as he can with you whether you’re eating together, walking around together, entering new places together, or just talking somewhere with one another. If he doesn’t want the night to end, then he’s telling you that he likes you and that he just wants to be around you. He loves your presence and he just wants to be near you. Finally, it’s in what he does after the date when you’re at home, you’ve ended the night, and you’re telling your girls about him. If he’s done all of the things above, then you should hear your phone ring because there’s the text you’ve been waiting for. He says that he’s home, he had a great time, and he wants to go out again. THIS IS IT! You can’t stop smiling, and you’ve just ended the night on a high note. There’s going to be a next time, and that’s all that matters. Cheers to what’s next to come. *None of these images or gifs belong to the author or Her Campus. Sara Geyer is attending UC Davis studying History and Communications. She works at the Telephone Outreach Program on campus, reaching out to stay connected to Davis alumni. Passionate to be involved in the community, she is also in the University Chorus. In her free time, Sara loves spending time with her friends and family, dancing, playing tennis, and volunteering. Grateful for this great community, she loves to meet new people and always be involved.